It is Haute-Couture season in Paris this week where the city of love lights up with some of the most extravagant creations in fashion design. To celebrate this wonderful week of creativity and flair, we thought it only right to give you a short cut history lesson on where the season came from and where it is now today. 1947: France’s fashion industry was successfully revived from wartime austerity with Christian Dior’s ‘New Look’ collection. Dubbed Corelle, after the botanical term for the frail petals in the centre of a flower, the collection featured a new-found glamour in the shape of tight waists, stiff petticoats and billowing skirts. 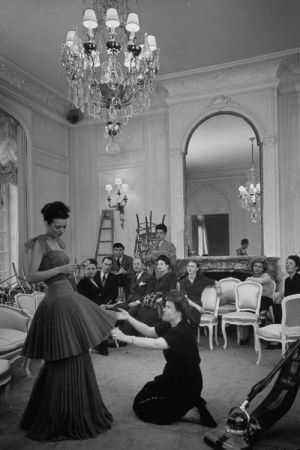 1970: The number of couture houses dropped to just 19 (there were 106 in 1946). 2014: Christian Dior brought the first haute couture show to Shanghai and Ralph & Russo joined as the first British brand in over 100 years of Couture Fashion Week. Paris’ fashion president, Didier Grumbach announced his stepping down from 16 years at the helm of the trade. Ralph Toledano will replace Grumbach as president of the fashion federation. 2015: 12 fashion houses show this week. Chanel stages a Casino night themed presentation and Margiela Artisanal continues to stun. Despite the decline, fashion houses continue to dedicate time and resources to showing the world just exactly why fashion has the capability to inspire and change the world.